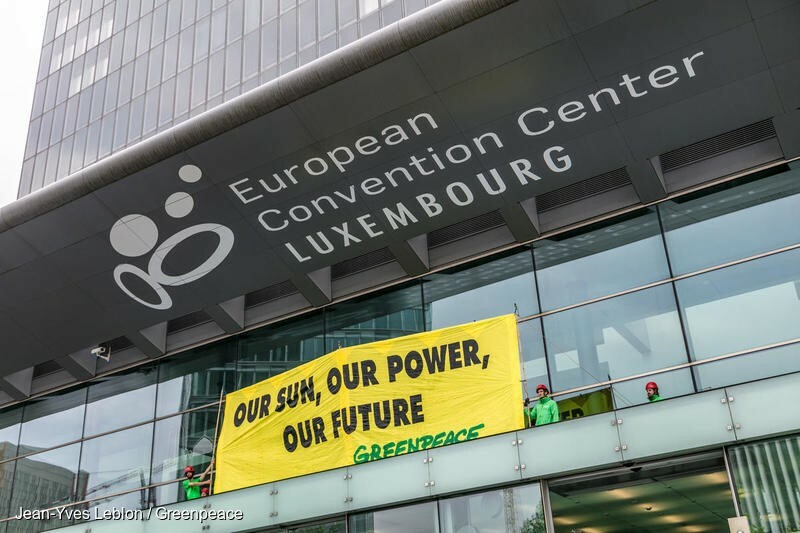 Luxembourg/Brussels – Climate change activists urged EU energy ministers meeting in Luxembourg to live up to their climate commitments and stop restricting the rights of people to produce and share their own renewable energy. EU energy ministers are gathering two days ahead of final negotiations with the European Parliament and the European Commission on the EU’s Renewable Energy Directive. The group of 35 activists from 8 countries  confronted ministers with banners reading: “Our sun. Our power. Our future.” and “People-Powered Renewables = Climate Action”. Ministers arriving at the meeting were greeted at the main entrance, the underground drop-off area and the back-access road. 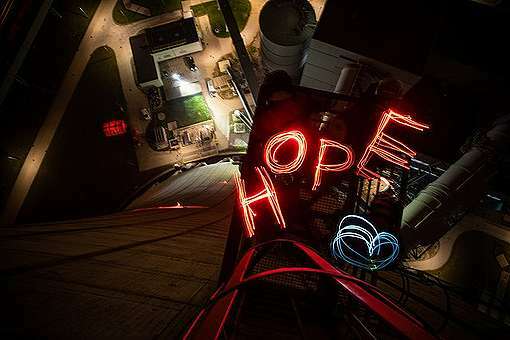 The activists also unfurled a giant sun covered with selfie messages from hundreds of Europeans calling on the EU to power a swift transition away from fossil fuels and nuclear energy to citizen-owned renewable energy. Belgium, France, Luxembourg, the Netherlands and Sweden have publicly supported the need to tackle climate change. The change of governments in Spain and Italy is expected to affect the negotiations. According to reports, the new Spanish government has already indicated that it will change the Spanish position, support renewables, and leave the group of conservative countries that includes Poland. It will also join the coalition of EU governments calling for climate ambition. A change of position by the new Italian government could further split European governments. Italy’s new deputy prime minister and energy minister advocated support for people-powered renewables during the election campaign. While Germany is a member of the climate-ambition group, it is also among the countries – including Poland and Hungary – that are blocking efforts to raise the EU’s renewable energy target for 2030 and to cut fees and red tape which discourage households and small businesses from investing in renewables like solar energy. The Council negotiating position and the final Renewable Energy Directive will determine the role of renewables in Europe’s energy system up to 2030 and beyond, as well as the potential for Europeans to self-generate, consume, share and sell electricity. Having more renewable energy in the mix would reduce carbon emissions and, according to scientific projections, a renewables target of at least 45 percent by 2030 would bring the EU in line with its commitments under the Paris climate agreement. The Council has shown openness to move beyond its initial 27 per cent target, but is demanding the Parliament back down from its support for a minimum 35 percent target. 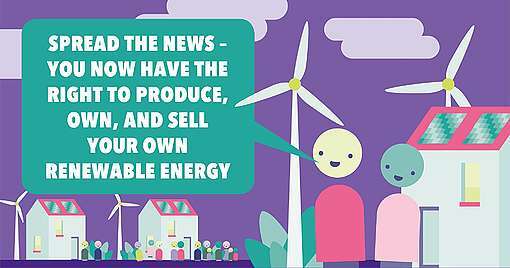 EU ministers and the Parliament also disagree on the rights of individuals, cooperatives and cities to produce and sell their own renewable energy. The position so far agreed among EU energy ministers could seriously penalise people generating their own energy. For example, it would allow national governments to impose punitive fees and to heavily restrict how and where people can produce and share energy, with additional burdens on those who do not own their own roof, such as tenants. Governments could also burden these small-scale energy producers with the same registration requirements as large power companies, if they feed any amount of electricity into the grid. The final negotiating session between the European Parliament, EU governments and the European Commission will take place on 13 June in Strasbourg. Belgium, France, Germany, Italy, Luxembourg, Portugal, the Netherlands and the UK. 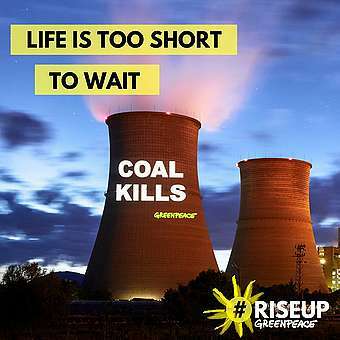 Greenpeace is an independent global campaigning network that acts to change attitudes and behaviour, to protect and conserve the environment and to promote peace. Greenpeace does not accept donations from governments, the EU, businesses or political parties.